Is a sod lawn less work? Yes, a professional sod lawn needs no special care because it is a healthy mature lawn when installed, whereas a sprigged or seeded lawn requires years of nurturing to reach maturity. 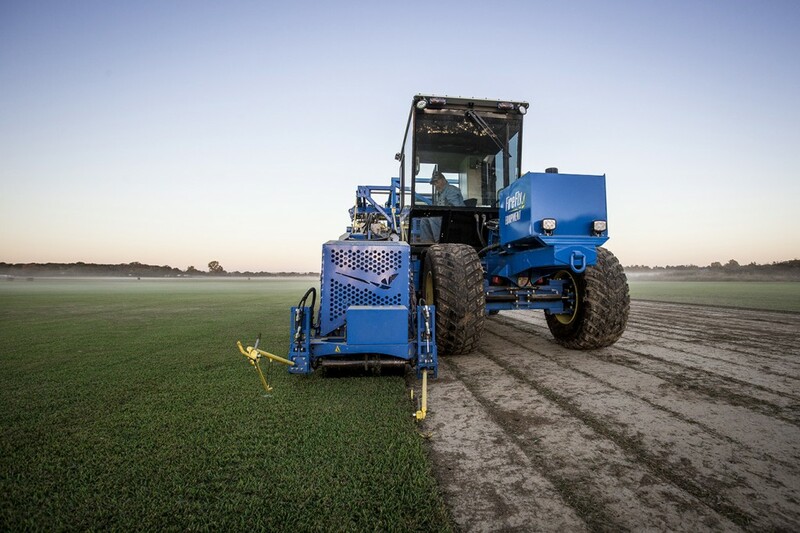 Sod is grown under expert supervision from either top quality seed blends or certified hybrid sprigs. After it’s been installed, just water, mow and fertilize your sod lawn as needed and it will remain a healthy, green carpet of grass, requiring very little maintenance. Where can I use sod? Sod can be installed practically anywhere, even where seeding is impossible or too costly. Sod is often used to stop soil erosion and water pollution on slopes where rain would wash away both seed and soil. Sod is available in a variety of grass blends to suit various needs such as climate, amount of usage, sun and shade conditions. Can sod withstand heavy usage? Certainly! Sod establishes itself quickly. In a couple of weeks, it’s ready for full use. It creates the perfect surface for lawn games and family outdoor living. With today’s various blends of hardy grasses, sod is chosen for parks, golf courses, athletic fields, as well as residential homes and business parks. When can I install a sod lawn? Sod has revolutionized the lawn business! Now you can install a sod lawn anytime during the year when the ground can be tilled. There is no need to wait for the “right” season to put in your lawn. Is sod a good investment? Yes—it’s the only way to go—from bare soil to lush, green lawn in just hours. Yet, it’s relatively inexpensive to use. In the few hours it takes to install your sod lawn, your property value increases significantly and even more in aesthetic value. How will sod affect our environment? With today’s ecological concerns, many more people are considering sod for its environmental benefits. Sod cools and cleans the atmosphere by reflecting the sun’s heat and absorbing noises, carbon dioxide and other harmful pollutants. It releases valuable oxygen and moisture into the air we breath. As it grows, sod silently contributes to a healthier environment. Sod lawns meet the needs of today’s fast-paced, demanding lifestyle. How is sod related to our lifestyle? Today we expect convenience, efficiency and quality in our products. Buildings are going up almost overnight and attractive landscaping is installed in hours. Why wait 1 or 2 years for a new lawn to struggle to maturity when you can have a beautiful sod lawn complimenting your buildings right now. That high quality sod lawn can be conveniently installed in hours, at a surprisingly low cost. A delivery fee may apply depending on the number of pallets ordered. Please contact our office at 901-867-8116 for current delivery rates. How much does a pallet of sod weigh? 1 pallet of sod weighs approximately 1500 to 2000 pounds. Can I pick up my sod? Once your order has been placed and a pick up date and time established, you may come to our location at 22860 Highway 196 Arlington, TN 38002, to pick up your order. Each pallet weighs approximately 1500 to 2000 pounds. Most standard size pickups will hold 1 pallet. Step-side truck beds are usually too narrow. If truck or trailer are too small or light duty to handle weight or size, the customer will be required to hand load the pallet. How do I look for insects in my yard? Perform the soap test. Mix 3 tablespoons of liquid dishwashing detergent to one gallon of water. Pour in a circle about 3 feet wide making sure to cover the entire area thoroughly. Wait for about 1 minute. If you have bugs or army worms, they will climb to the surface.